Yeehaa! Saddle up for a great Cowboy Birthday Party! Giddy up Cowpals!! 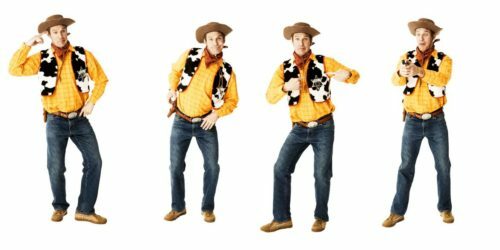 Saddle up your little cowboys and cowgirls for a fantastic adventure with one of our authentic Cowboy themed party entertainers. Coming straight from the Wild West, they’ll be riding into your place to take the kids through a new and never before seen experience. Suitable for both boys and girls, they can choose whether they want to be a cowboy or a cowgirl. Your kids will play cowboy party games and activities and party into the sunset. They’ll learn how to lasso and even take part in a real life Cowboy duel! 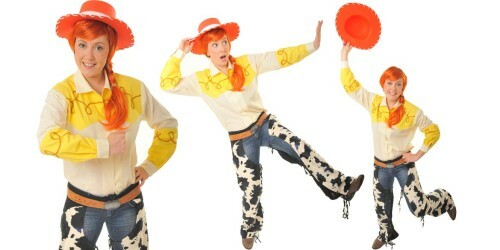 Choose from the Toy Story characters Woody the Cowboy and Jessie the Cowgirl. Or go off the beaten track with our rustic and real Cowboy and Cowgirl! Make It More Than A Cowboy Birthday Party! When is a Cowboy themed party not a Cowboy themed party? When its a Toy Story themed birthday party!! 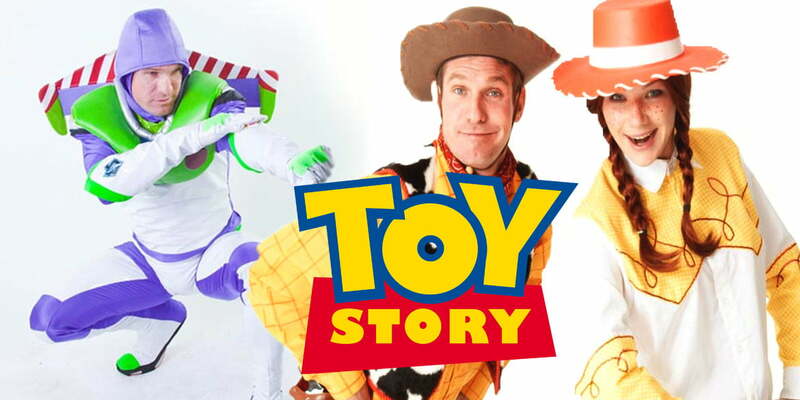 Why not make your birthday party into a super special day with Woody, Jessie and their top mate, Buzz Lightyear! The kids will learn what it’s like to be a toy in Andy’s room as well as battling the evil Zurg and escaping the clutches of Lotso the Bear! 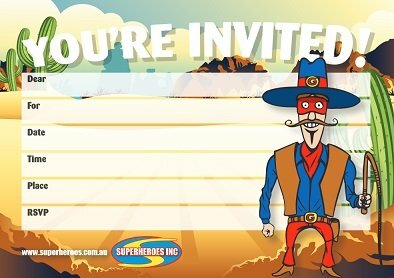 Why use Superheroes Inc for your Cowboy Themed Party? Over the years, we have developed a tried and true formula for offering the best party entertainment in Sydney. Our entertainers do exactly that – entertain, not babysit – and are trained as such with high expectations. We take a lot of pride in what we do, and we aim to provide you with the best. From our specifically made costumes, to knowing that no two parties are the same, we are able to offer a range of packages to suit your specific needs, or we can tailor a show just for you. Our shows are tailored to you and your needs. There’s no ‘One Size Fits All’ here! 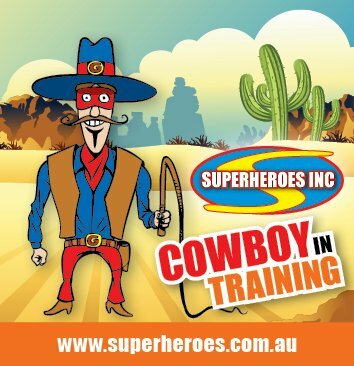 At Superheroes Inc, we have the knowledge, expertise and Cowboy party activities to make your day easy and fun, so all you need to worry about is what you’ll wear to the ‘Parent of the Year’ awards! If you’re looking for something different, we also have loads of Cowboy party activity ideas and free Cowboy themed party invitations for download to help create a specially tailored event just for you! Please feel free to call us to discuss how we can make your Sports themed party extra special! Or click through to our FAQs where we answer all your questions! Choose from written FAQs or our video blog page! Fun And Games For Your Little Cowpal! Each Cowboy brings their own individual style to the party, and the games and fun will reflect the sport of your choosing. There’s plenty of games & activities for the kids to enjoy on their way to becoming a Cowboy; and while our birthday party entertainment is tailored to you and your event, we have a rough format below of what you can expect at your Cowboy themed party. Bring along our own portable stereo for exciting musical games! We’ll even stick around right to the end to help sing happy birthday and get photos with the whole party! We know exactly what it takes to make your Cowboy themed birthday party fun and easy! 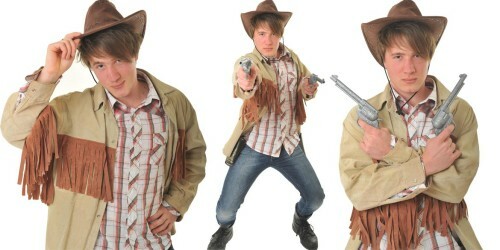 Book Your Cowboy Themed Birthday Party Today! With loads of Cowboy party activities, we’ll be sure to keep the little buckaroos happy at your Cowboy themed birthday party. And if you can’t find your favourite character on our list, please ask – we’re always adding more! To book your Cowboy party entertainer, contact Superheroes Inc. today!